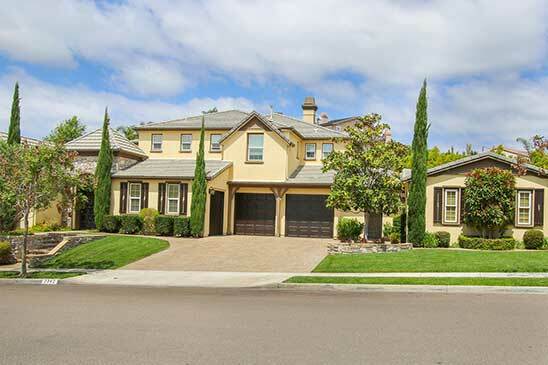 Carlsbad Expensive Homes: Beaches and La Costa Villages priced at and above #1 million. Real estate in San Diego has become expensive–but I decided to check out the most Carlsbad expensive homes because the terrain is so varied. To the west are expansive sandy beaches and inland are golf courses, hillside estates and condos, and the newer and very lovely La Costa Villages. In checking out the current market, we see there are 87 homes in Carlsbad priced at or above $1 million. Additionally there are 35 pending sales in same price range and in the past 12 months, 92 homes at or above $1 million have sold. The most expensive homes in Carlsbad? The three most expensive listings sold here in the past year have been oceanfront homes in the quiet little subdivision of Terramar. Here, 5099 Shore Drive sold (after only 13 days on the market) for $6,500,000–or $1271.00 per square foot. Runner up was 5001 Tierra Del Oro, which sold late last year for $5,950,000 or $1239 per square foot. Finally, an older and smaller home at 5201 Shore Drive sold last summer for $3,775,000, or a whopping $1808.00 per square foot. Other seven-figure sales occurred in Aviara, La Costa Oaks, La Costa Valley, La Costa Ridge, Bressi Ranch and Olde Carlsbad. Want to search all currently available “most expensive homes in Carlsbad” priced at or above that magical $1 million mark? The ones listed below show most recent listings first. Check back frequently to catch all the new listings! Prime location in Carlsbad Village. 3 bed 1 bath vacation home/rental or 5 unit development opportunity in the heart of Carlsbad Village. Great walkability to shopping, restaurants and beach. 6936 sq ft lot with 1288 sq ft of office space or residential living. Property sits directly across from Union Bank and also directly behind the new Grand Ave project which will contain 11 luxury condos over retail space selling between 1M-1.6M. Based on information from California Regional Multiple Listing Service, Inc. as of April 22, 2019 08:26 and/or other sources. All data, including all measurements and calculations of area, is obtained from various sources and has not been, and will not be, verified by broker or MLS. All information should be independently reviewed and verified for accuracy. Properties may or may not be listed by the office/agent presenting the information.